This vibrantly illustrated and amusing adventure will make learning about weather feel incidental. 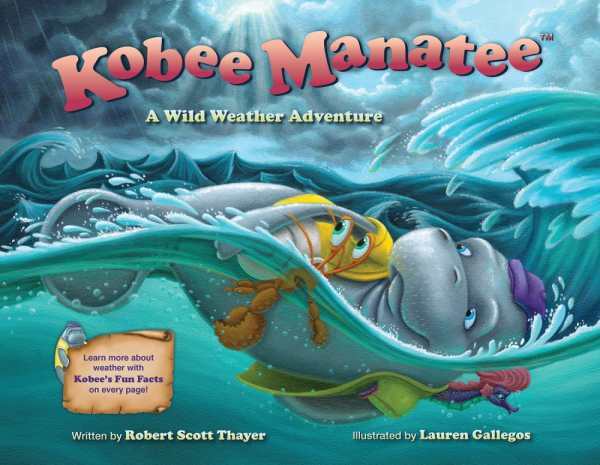 With stunning images accompanying an adventurous tale that teaches young readers interesting weather and geographical facts, Kobee Manatee: A Wild Weather Adventure is a delight. Kobee and his seafaring pals are on a voyage across the Gulf Stream to surprise his sister Kim for her birthday in her home waters of Nassau. They know the three hundred mile journey will be risky—it’s hurricane season after all—but they are brave and tenacious and so decide to give it a try. Using cloud formations to predict the weather and traversing several climates, aquatic features, and sometimes perilous weather events, the friends stick together through both storms and sunny skies. Lauren Gallegos’s lush and vibrant illustrations make the book truly special. Her bold colors and dynamic scenes bring to life all of the adorable characters and their surroundings. The hurricane-plagued seas truly feel violent, while the waters of Blue Lagoon feel calm and bathtub-warm. Kobee and his friends are emotive and lively. Though rooted in scientific teaching and dense with weather and water facts, this is an amusing story that will make learning feel incidental. Each scene features a sidebar called “Kobee’s Fun Facts” that offers a bigger breadth of learning for older readers, such as definitions of weather phenomena and an explanation of Fahrenheit and Celsius. While most of these facts line up with the story’s plot points, a few feel a little out of place and thus inconsistent. But this is a small matter in an otherwise wonderful volume that is highly recommended for weather watchers of all ages.